We were traveling all last week. From family to friends and home again. 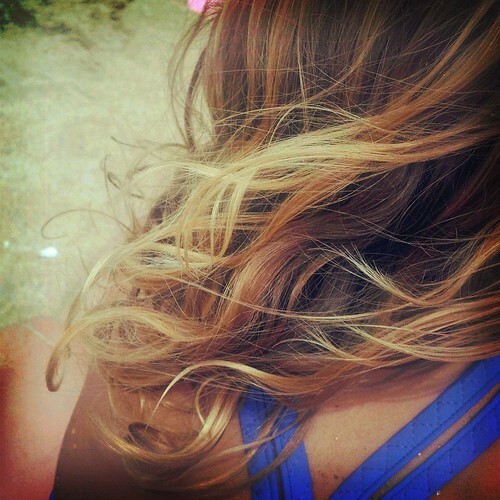 We are back to beach curls and salty kisses. Truthfully, we're only home for a few days and then we hit the road again for another few days, then home for two or three and back out... this first part of July on the calendar is thick like the air is with humidity. We are dripping with summer. Those curls are a wonderful capture - both of the pretty, flowing hair of a child...and that wonderful feel of summer! Enjoy all your adventures! I clicked on over from FB because of this beautiful picture. Happy summer my friend! Ours is going in full swing over here too...which also explains my lack of time in the blogsphere. Small tradeoff I suppose for all the fun we're having? (And the work I'm doing on the side - sigh). Enjoy your sunny, beach-filled days! It is funny how much LIFE we cram into the summer months. Enjoy the dripping! Happy Summer!! I enjoy these lazy days of summer (or not so lazy depending on the day!!) My little one's hair curls like this on these humid days as well! Do you have a recipe for your sweet tea? I can't find one I like! I always love how much beauty you infuse in the simplicity of life. There is something about this (and all of your writing) that feels like a pause. Swoon. What a gorgeous picture - and the phrase, "dripping with summer," is just perfect. are those paige's curls?!?!?! so pretty!!! been loving your photos on ig and facebook... but I have been meaning to give you more than a <3!!! soon! glad you are enjoying these days!